When the Nike+ system came out a few years ago I had a hard time buying one for myself since I had just purchased my second Garmin Forerunner. But clever me, I magnanimously bought one for my wife, also a runner, for our 10th anniversary. I like to run with music, but early-on Nike announced the Nike Speed+ which allows you to use the Nike+ system without the iPod and simply displays your run data. Expected sometime in April, the SportsBand will be available. This slimmed-down model has a rocker/runner look but also a practicality in it’s construction using materials that will hold-up well to sweat and grime. The same Nike+ sensor in your shoe relays pace, distance, time and calories burned to the easy-to-read LCD on the SportsBand. 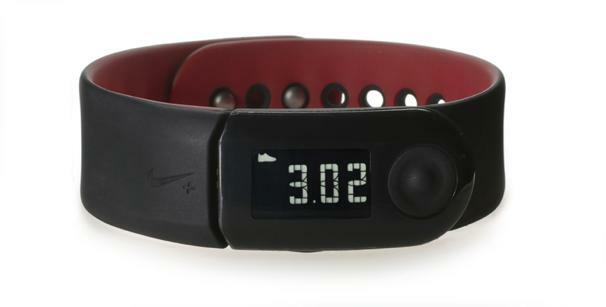 A detachable USB built into the band’s face can store up to 16 hours of run data and be attached to your computer to upload data to Nike+.